If you are looking for info on the amateur (“ham”) radio mode called JT65-HF, you’ve come to the right place. I’m honored to be one of the earliest (#4) GAPA (ex-“TARA”) JT65 awards recipients, a digital set of Maidenhead awards, records found here, and also #1 for the JT GAPA Pinnacle award. Make sure you know the standard “sequence” (the back-and-forth exchange) of a QSO — each piece takes 1 minute. Key note: only proceed to the next step if you heard that the other station proceeded to his next step – otherwise, repeat the step you’re on until you hear him proceed. 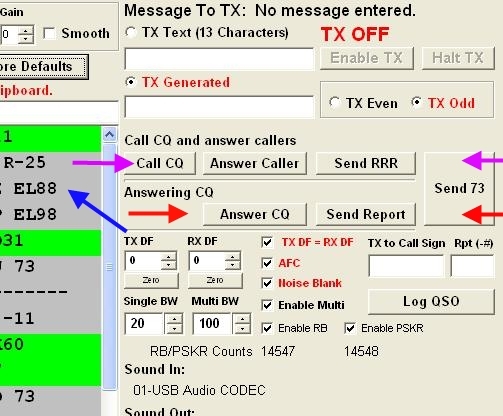 The buttons in the JT65-HF software show the natural progress of a contact – the first row of buttons if you’re doing the CQ, and the second row of buttons if you’re answering a CQ. The CQing station would use the row of buttons pointed to by the purple arrows, and the responding station would use the row of buttons pointed to by the red arrows. OR, you can double-click on the signal you want to respond to (blue arrow area), and the next logical exchange sequence will be generated and sent — refer to steps #1-7 above. Here is an introductory article on JT65-HF, which I was pleased to have published on eham.net. Check out W7GJ’s excellent “JT65 setup checklist for new users“. What does JT65 on HF sound like? Click for a 10-second mp3 file that has a recording of 2 JT65-HF signals at the same time. Please take the time to read the well-written manual (and the v1.0.9 addendum), which are the two .PDF files found in your Program Files/JT65HF### folder– it will be worth your while! MANY JT65-HF users use Logbook of the World (LOTW). This is digital amateur radio, cutting-edge stuff, after all! We urge you to use LOTW. Sure, the sign-up may be a bit cumbersome (to maintain integrity), but once done, it is done. It is a quick and easy (and cheap!) way to get QSOs confirmed. Go here for some excellent LOTW setup instructions. And if you don’t want to do LOTW, at least consider using eQSL. Note: it is to your advantage to use LOTW and/or eQSL — some guys are much less likely to answer your CQ if there is no easy/electronic way of getting confirmation. 1st (also 2nd) 1 160m 1838, others? 5th (also 6th) 5 60m ARRL has indicated in this article that most digital modes (which includes JT65) ARE allowed on 60m after all! Set your rig to proper 60m USB DIAL freqs (I suggest channel 3 first, then 2 as a 2nd option). Set JT65-HF to DF of +229 or +230 (so your signal is center-of-channel), make sure there are no other signals on the freq, and go! ARRL-recommended practices are here. JT65-HF itself: download the latest software and setup doc – thanks, Joe, W6CQZ, for an excellent program! JT-Utilities, including JT-Alert, superb companion to JT65-HF, with visual/audio alerts and logging tools; get it, because it is very useful – thanks, Laurie, VK3AMA! Hamspots site – automatically done-by-the-software spots (in JT65-HF), for “cluster”-type spots for JT65-HF and other digital modes — allows you to see who is hearing your signal, etc. Being a fan of keeping it low, at least on JT65 and other digital modes, here are the results. Note that a vast majority of these are in the mid- and lower-HF bands.